As landlords, it is vital that you know all the options available to you to get the money due you! Here is the Ultimate DVD/Manuals Training Set for Collecting Unpaid Judgments! And the best news is that she has researched and developed a manual for every state. Learn from the expert, Cynthia Schmidt, who gave a powerful training at our recent MrLandlord.com Convention and inspired hundreds of landlords to pursue ALL the money due them. She has personally collected 96 satisfied judgments (over $250,000) representing herself in court. She is now offering one of her Collect Back Rent Manuals for the seasoned investor who has been awarded the judgment but wants to know how to collect on it. She tackles the Wage Deduction procedure, Bank Levy, Levy on Personal Property, Debtor's Examination (Discovery), Rule To Show Cause, Contempt of Court, Bench Warrant, Motions to Judgment Satisfied. Each procedure is fully discussed in detail with the needed forms which makes it easy to understand. The Collect Back Rent Manual included consists of 141 pages that will show you how to collect the money you deserve! "Inspired by Cynthia Schmidt (the "hyper enthusiastic" Collections Lady! at Convention 2015), Wifey has been been motivated to dig thru our files.... she is now bringing in $2500 per month from these old judgments." - Brad 20,000, IN. 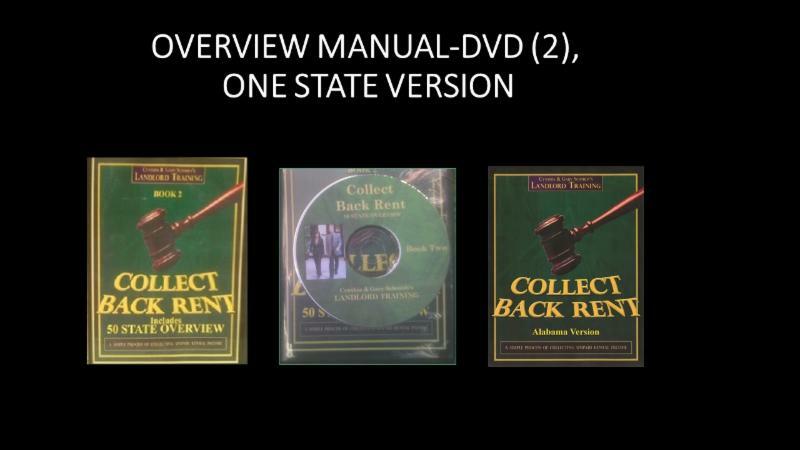 As part of this Training Collection Set, you will receive a Collect Back Rent DVD which was filmed at a live workshop of Cynthia teaching the procedures in a Collect Back Rent Manual. Cynthia had the DVD filmed to coincide with Manual so you will better understand the procedures in post-judgment. It is just like Cynthia is teaching you directly, which she feels that is the key to your success. She suggests to study the Manual with the DVD to fully understand the court system. "Cynthia's passion for collecting judgments. No longer will I walk away from money owed me...." - Ellie, IL. To complete this Ultimate Training Collection Set, you will also receive one State-Specific Manual for where you own rental property. Cynthia has written a version for all 50 states which takes the landlord a step further. Knowing all the procedures in Manual is the first step to understanding collection procedures, but learning the procedures for your specific state will take you to the top and help you collect ALL money due you. Each state-specific manual has the state specific procedures, forms and a post-judgment flowchart (Note: You'll receive state manual that corresponds with your shipping address unless you tell us otherwise). Stop letting residents steal from you and get away with it! According to Cynthia, "70% of all judgments can be collected (if you know how to do it)". Order the complete three-part Training Collection Set. Regular price is $497. Through arrangements with the author, MrLandlord readers and visitors can order the set for half price, only $247 (save $250), with free shipping. Call 1-800-950-2250 or click below now to order.